How many people watching the Chrysler/Eminem commercial during Sunday's Super Bowl spotted a connection to Whitefield, Maine? Native son and retired schoolteacher David Chase was one of the indisputable few. Or possibly he's in a class by himself. Chase maintains an online old-and-ongoing curiosity shop of historical tidbits, scientific oddities, profiles of local people, links to media sites, recipes, weather information and much more at mainething.com. In recent years he has developed a timeline of Whitefield people and events, dating from "prehistory" through the town's 1809 incorporation, up to present times. On Sunday, as cameras in the two-minute ad flowed through a landscape of urban arterials and belching smokestacks to downtown Detroit's historic financial district, Chase recognized the brick and granite façade of the Penobscot Building - the original 13-story edifice, glimpsed in about one nanosecond of footage, was built by Simon Jones Murphy, who was born in Windsor in 1815 and grew up in Whitefield. Having researched Murphy for his website timeline, Chase learned he spent most of his childhood and youth on the Hilton Road farm of his maternal grandfather, Jonathan Jones. He left home at age 18, walking to Bangor with a friend. There he began logging on the Penobscot River and eventually became a prosperous lumberman. Just before the Civil War broke out, when he was in his 40s, he moved his family to Detroit where he formed a partnership to begin lumbering the vast timber resources of Michigan's lower peninsula. 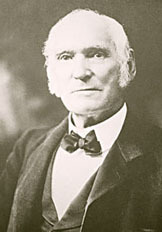 Murphy went on to become one of the country's wealthiest businessmen and, as Chase writes in his "Illustrated Timeline of Whitefield, Maine," "one of our most famous." In addition to lumbering, the Mainer built many of early Detroit's important utility services, including Murphy Icehouse, Murphy Power, and Murphy Telegraph (later Bell Telephone). For the latter he constructed the Murphy Telegraph Building in 1901. He also had extensive real estate holdings and served on boards of various corporations, including banks, utilities and insurance companies. Of the three buildings in what became known as the Penobscot Complex or Penobscot Block, the businessman, at age 88, undertook construction of the first Penobscot Building, 13 stories high and designed in the Beaux Arts architectural style. Because he died in 1905 at age 90 before it was finished, his son Charles oversaw its completion that year. The official Penobscot Building website states: "Since 1905, the world of business has revolved around Detroit's internationally recognized landmark, the Penobscot Building." A second building (the New Penobscot) was erected in 1914 by son William H. Murphy, another of Murphy senior's 12 children. The third (the Greater Penobscot), 47 stories and 566 feet tall, was also built by William and the Simon J. Murphy Company in 1927-29. It was acclaimed as the world's fourth-tallest building in the U.S. and the eighth tallest in the world at the time. This structure presently serves as the area's fiber-optic and wireless communications hub in a district where sports and entertainment also thrive. The Greater Penobscot is described as rising "like a sheer cliff for 30 stories, then has a series of setbacks culminating in a red neon beacon tower." Much of the design and sculpted-granite ornamentation reflects Native American styled art, and is named for the Penobscot nation and river where Murphy earned his early livelihood and where his prosperity began. Murphy also owned a fruit farm in California and, in the late 1800s, launched a family-owned lumber company in northern California that harvested Redwoods. On Tuesday, the online video service Hulu released ratings of Super Bowl commercials. The Chrysler ad made the top 10, with 78 percent viewer approval.